Over the past 30 years, tools once reserved for presidents, spies, generals and media moguls have been made available cheaply to billions. Wireless communication. GPS. Satellite photography. Streaming live video to a global audience used to cost millions. Now, it's free and you could be doing it in five seconds if you wanted to. Every great leader, from presidents to CEOs, is surrounded by trusted advisors who guide and inform at every step. Successful leaders often succeed in part because they have better advice or better information. And now, even advice and guidance is being distributed to a mass market. This A.I. will talk to us -- and we'll talk back. It will know everything about us, understand our current situation at all times and provide helpful guidance and information. A.I. is software, of course. So what's the hardware? When it comes to A.I. virtual assistant software, I think it's clear that the hardware is: digital wireless earbuds. Critics slammed Apple for removing the jack. Users have invested in earbuds, connectors and accessories that use that jack. Anyone who upgrades to the iPhone 7 will have to use awkward "dongles" and other work-arounds. Earbuds without cables can be more easily lost, stolen or even swallowed. And the AirPods' $159 price is far higher than the $29 Apple currently charges for its standard earbuds. The complaints remind me of the ubiquitous griping in 2007 about the Apple iPhone's lack of a physical keyboard. The omission outraged everyone. Yet Apple was so far on the right side of history that in July of this year even BlackBerry discontinued the BlackBerry classic with the dominant physical keyboard. It turns out the iPhone keyboard critics were just being dragged kicking and screaming into a usage model that everyone would soon prefer. Five years from now, the idea of earbuds with physical cables will be looked at with nostalgia and wonder -- "How did anyone use such a primitive, unwieldy Victorian-era contraption?" The transition from wired earbuds to AirPods is so much more than a transition from wired to wireless or from analog to digital. The biggest thing going on here is the end of "dumb speaker" earbuds, and the mainstreaming of hearables -- actual computers that go in your ears. Bigger still is that the interface for these tiny computers is a virtual assistant. When you double-tap on an AirPod, Siri wakes up, enabling you to control music play and get battery information with voice commands. 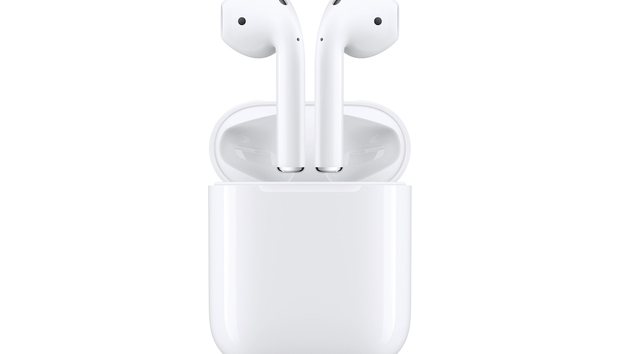 AirPods use a proprietary new W1 chip that uses very low-power Bluetooth to sync the two earbuds, plus electronics for dual infrared sensors and accelerometers that can detect when AirPods are in your ears (they stop playing when you remove them; if you remove one, the music switches from stereo to mono). Proprietary pairing technology in the W1 chip enables faster and easier connectivity, according to Apple. The earbuds also connect via iCloud to identify and "bond" with your other compatible devices. In a nutshell, Apple is using very advanced technology to make pairing and playing fast and easy. Apple says the AirPods' accelerometers can tell when you're talking, which activates "beamforming microphones" to zero in on your voice and filter out everything else. That feature should enable people to speak quietly both to callers and to Siri, even in a noisy environment, and still be heard and understood. To take advantage of AirPods' special features, you need a device running iOS 10, macOS Sierra or watchOS 3. Or you can use AirPods with any Bluetooth device without the special features. AirPods last four or five hours on a charge, and come with a charging case, which itself retains a charge and charges the AirPods for an extra 24 hours of battery life. If you lose one of them, you can buy a single replacement. What's interesting is that the introduction of AirPods mainstreams hearable computing, plus the use of hearables to talk to an A.I. assistant. Here's what else is coming to an eardrum near you. I told you in this space about The Dash earbuds from Bragi, which cost $299 and can play music and other sounds from a smartphone and also function as fitness trackers. The Dash earbuds also process sound before sending it along to your ear, giving you the option to use The Dash app for filtering out unwanted sounds while amplifying the wanted ones. A tiny touchpad on the earbuds let you use gestures to control the sound. Bragi and IBM this week announced a partnership that will result in IBM's Watson IoT platform being integrated into The Dash earbuds. The Watson-enhanced earbuds are aimed at business people, according to the companies' news releases. The product will handle speech-to-text and language translation, and enable companies to track workers -- even monitor their vital signs at work to maximize safety. The partnership appears to be in part a kind of Google Glass-style "Explorer Program" for testing various head gestures for controlling The Dash earbuds, with products coming to market at some point in the future. Every major consumer electronics company is building A.I. earbuds. Google is working on a secret initiative called Project Aura. (Don't confuse Project Aura with Google's Project Ara, a modular smartphone research program discontinued this week.) Project Aura is rumored to involve an enterprise version of Google Glass, plus one or two audio-only wearables -- often described as Google Glass without the glass -- essentially screen input replaced by voice and Google Now. Microsoft is reportedly building a hearable device, possibly aimed at women, called the "Clip." The earpiece would enable hands-free interaction with Microsoft's Cortana virtual assistant. Sony's long-awaited Xperia Ear product is expected to ship in two months. The device is being designed around a "voice agent," which will tell you the news and weather, update you on your schedule for the day, provide turn-by-turn directions, send text messages and answer your trivia questions. One very cool feature that I expect will soon be nearly universal on wireless earbuds is the ability to respond "yes" or "no" to your in-ear virtual assistant silently by nodding or shaking your head. These consumer electronics giants are trying to head off a wave of insurgent startups who want to own the interface of the future. A startup called LifeBEAM successfully crowdfunded this year what it calls the Vi headset. The hardware comes with artificial intelligence software that functions as a fitness coach. It can also monitor your temperature, heart rate and other metrics while you're working out. You can also do Siri-like things such as using voice commands to initiate a call. LifeBEAM's Vi is expected to ship next year. These are just a few of the A.I.-enabled hearable computing devices now in the works and coming soon. Today's AirPods, as well as the many initiatives creating A.I.-delivering hearables, will no doubt be improved in every way over the next five years. Battery life will get longer. The earbuds themselves will shrink. And the A.I. will get way, way smarter and better informed. Very soon, most smartphone users will wear A.I. earbuds all day, every day. They'll not only give us a very smart virtual assistant, but also keep us informed, help us communicate and filter out unwanted noises in our environment. Once that happens, we'll all have our own personal advisor every day, all day -- powerful A.I. whispering in our ear. This amazing future begins with letting go of our cheap, dumb, wired, analog earbuds and embracing a new world of A.I. hearable computing devices.